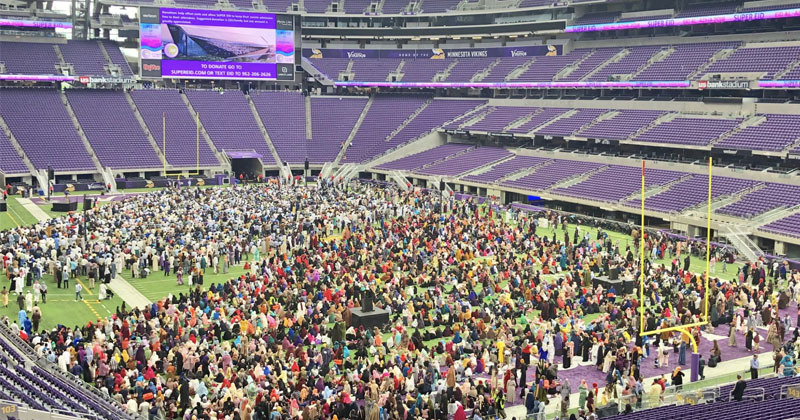 Minnesota - 30,000 Muslims Swarm Football Stadium For "Super Eid"
Thousands of Muslims from dozens of mosques in Minnesota congregated at the US Bank Stadium to celebrate "Eid al-Adha" which means the "Festival of Sacrifice." The gathering was meant as an opportunity for Muslims to pray, share their faith and come together as a community. The celebration coincides with the Islamic holiday "Hajj" which celebrates the Islamic pilgrimage to Mecca. Because of the nature of the holiday and its relation to animal sacrifice, the US Bank stadium has felt it necessary to declare no sacrifices would be taking place. A spokeswoman for the Minnesota Sports Facilities Authority Jenn Hathaway said, "No animal sacrifice will take place at U.S. Bank Stadium." A local news reporter shared a video of the chant "Allahu akbar" blaring over the stadium's loudspeakers. Isn't that what nearly every terrorist who has ever committed an act of terror shouted just before they stabbed a police officer or mowed down a restaurant full of people? Laura Loomer reported that one of the guest speakers at the "Super #EidAlAdha" festival was Egyptian imam Waleed Al-Maneese, a man who has called for Jews & Christians to be killed. There is some dispute as to the number of the Muslims in attendance with the Star Tribune reporting 30,000 and Infowars and Laura Loomer reporting 50,000. I wonder if any white Muslims would be welcome to come to pray and be a part of the community? If there was a Christian gathering at a stadium like this, but there was not a single race other than white people present would that seem very inclusive? I think that it is unsafe for the American born people to have this going on it should have been shut down. Call it hate if you want I call a dame shame that we kiss there asses here. The hajis must go, but they didn't let *themselves* in. No! It means "allah is greater", you turbotard. Had them all in one place great time for a moab!